A prolonged programme of industrial action, hitting civil and public services across the UK moved a step closer today, as PCS members backed strike action in a dispute over the government's 2% public sector pay cap. 80% of those balloted supported action short of strike, and 54% of those taking part in the ballot backed union plans for industrial action, which includes national civil service wide strikes, targeted strike action and overtime bans. The union’s national executive committee (NEC) will be meeting on Thursday 23 October to finalise plans and decide on dates for the programme of industrial action which could stretch over the coming months. An announcement confirming these plans will be made on 23 October. The ballot result comes as civil and public servants across the UK face mounting pressure on their finances as a result of the government’s public sector pay cap. With a quarter of the civil service earning less than £16,500 and thousands earning just above the minimum wage, the government’s policy of capping public sector pay has hit some of the lowest paid in the public sector the hardest, leading to real terms pay cuts and pay freezes. Pay in the civil service is worse than other parts of the public sector because ‘progression’ (moving from the minimum to the maximum of the pay range) is included in the government’s pay cap. Hence there is less money available to fund basic pay awards. This year has already seen pay strikes hit jobcentres, passports, immigration and coastguards across the UK, as well as strikes in the Scottish courts service, museums and Sportscotland. 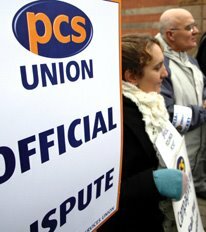 PCS members have also co-ordinated their industrial action over pay with other public sector unions, including NUT, UCU and Unison. Commenting, Mark Serwotka, PCS general secretary, said: “The hardworking people who keep this country running, from passports, immigration and justice, to coastguards, tax and jobcentres, face increasing financial hardship because of the government’s public sector pay cap. "Pay freezes and real term pay cuts are simply not sustainable when you are earning a pittance and experiencing double digit rises in food, fuel and housing costs. Bailing out bankers should not be at the expense of those who deliver public services or those who rely on them. “Members feel betrayed and this ballot result illustrates that they are prepared to stand up for fair pay. The union’s NEC will be meeting next week to take forward that result and finalise plans for a programme of industrial action.